The Literacy Beat bloggers are back on the beat! We’re rested and relaxed from the winter holidays with lots of great new ideas to share. Stay connected with us over the next several months. We’ll once again be posting dynamic new content weekly. This week’s post is dedicated to a incredible new e-book that has inspired me to think in new ways about incorporating tablet technologies into literacy and content instruction. Schools all over the world are making iPads a part of the classroom experience. Yet how can we best use this tool in ways that support student learning? 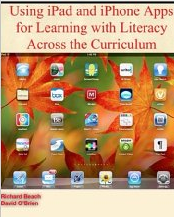 Rick Beach and David O’Brien from the University of Minnesota offer their insights in Using iPad and iPhone Apps for Learning Literacy Across the Curriculum. It is one of the best professional books I’ve read this year. Not only is it one of the only books out there that explores tablet use (an area that has grown exponentially in the last year) but it tackles this content from a literacy and learning perspective aimed at supporting teachers’ pedagogy. The e-book was released on Dec. 26th and is available from Amazon as a Kindle Edition and on Apple iTunes Books. Each chapter of the book addresses an important area of literacy instruction. For example there are chapters focused on Writing to Learn, Discussing to Learn, Using Audio and Video to Learn and Using Images to Learn (to name but a few). Each content genre that is covered showcases new dimensions of literacy and learning that apps make possible. Echoed throughout the text is an emphasis on learning contexts such as focused collaboration, peer-supported reading and writing, use of visual and multimedia to express ideas, sharing learning with audiences, and student-teacher communication. Beach and O’Brien think about the uses of apps in terms of their affordances. They define app affordances as the particular features of apps and the ways they mediate the uses of literacies and show tangible ways that app affordances serve as tools connecting the student with certain goals for learning. They assert that these affordances are not in the apps themselves but rather are part of the learning context. This way of thinking suggests that using tablets purposefully in the classroom requires creating a context in which apps are a part of the instructional context for learning (not the end in and of itself). Reading about apps for iPads, iPhones, and other portable technologies, sparks a desire to check out the features and explore possibilities. For this reason, the e-book format is perfect for this type of text. Some of the most powerful examples of the potentials of apps demonstrate how they can be used for building conceptual understanding and communicating ideas through use of concept-mapping, screencasting, or video production apps. Beach and O’Brien show how these apps allow students to access information and create their own products that include rich visual representations. The book includes numerous links that bring readers directly to examples that illustrate the authors’ key ideas. But what sets this book apart from others is its range of resources referenced. A supplementary wiki http://usingipads.pbworks.com and website http://www.appsforlearningliteracies.com provide even more to explore in the form of resources and further reading. Congratulations to Rick and David on an incredibly useful and timely book. While many e-books are not lendable, my Kindle edition indicates I CAN in fact lend out my e-copy. Feel free to add a comment below if you’d like me to share with you.